There are a lot of interesting functions that make the HX400V appealing, including the 50x optical zoom, built-in Wi-Fi and creative functions. The key selling point of this camera is its massive focal length. It keeps the incredible 50x zoom length of its predecessor, the HX300, which equates to 24-1200mm in 35mm terms. Impressively, it also manages to have a maximum aperture of f/2.8 (at the widest point of the lens), rising to f/6.3 at the telephoto end. It's also a Zeiss Vario Sonnar T* lens, which should mean that it's capable of producing high quality images. Outwardly, much of the HX400 remains the same as the camera it replaces, such as the three inch tilting screen on the back of the camera. Inwardly though, the HX400 has seen some key improvements that should equate to better image quality. For starters, the latest image processor, the Bionz X can be found in the camera. This is the same processor as is already being used in the top-of-the-range full-frame A7 and A7R cameras. Bionz X is claimed to be three times faster than the previous generation of processor, so focusing, start-up, shot-to-shot times should be improved, as well as noise reduced in low light/high sensitivity images. Whereas the HX300V had a 20.4 million-pixel Super HAD CCD sensor, the HX400V has been upgraded with a 20.4 million-pixel back illuminated Exmor R CMOS sensor, which should also help with low light shooting. Furthermore, the camera has a native sensitivity run of ISO 80-3200, which is expandable up to 12,800. It also inherits some of the other interesting technologies from the A7 and A7R, including detail reproduction technology, diffusion reduction technology and improved area specific noise reduction – all of which should combine together to beat the results that the HX300 was capable of. 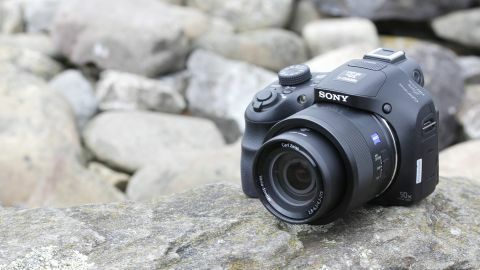 Another improvement is that, like many of Sony's other recent introductions, the HX400 is fitted with integrated Wi-Fi and NFC technology, which can be used for remotely controlling the camera from a smartphone or tablet, or for sharing images to social networking sites. As with several other Sony cameras, you can increase the functionality of the camera by downloading additional apps from Sony's PlayMemories store. You can also send images from the camera directly to a smartphone or tablet for emailing or sharing on social networking sites. The rear-screen is a 921,000 dot Xtra Fine TFT LCD screen, and although it isn't touch sensitive, it does tilt upwards and downwards, which should be useful for shooting from awkward angles. The screen is joined by an electronic viewfinder, which has a sensor for automatically detecting when the camera has been lifted to the eye. The finder itself is bright and clear, and offers a great view of the scene. Bridge camera EVFs tend to be a disappointment, but happily, the one here is actually useful and we found we used it very frequently during the review. The camera offers manual control, along with semi-automatic modes, such as aperture priority, as well as a complement of fully automatic and scene modes. Creative options are also included, such as digital filters and a sweep panorama mode, and should appeal to the Instagram crowd. It's worth noting however that unlike some other bridge cameras on the market, the HX400V is not capable of shooting in raw format. Sony claims that the HX400V's battery is capable of lasting for around 300 shots. We're keen to test the battery life as this is aimed at travelling photographers who wouldn't necessarily be able to charge a camera very often. There are quite a few bridge cameras in this premium segment of the market, but the natural competitors for the HX400 seem to be the Canon SX50 HS, Panasonic FZ72 and Fujifilm HS50.